An understanding of these attributes and the factors that influence them can inform management responses that aim to maximize the resilience of reefs to climate change. 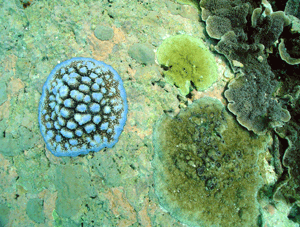 Severity of bleaching event: The severity of a bleaching event affects whether a coral loses zooxanthellae in response to thermal stress and also affects the amount of zooxanthellae lost. Immune system response: A weakened immune system is less capable of fighting off disease. Because coral reefs are weakened by a bleaching event, their ability to reproduce and fight diseases may be impaired. Metabolic adaptations: Persistence of these coral reefs may depend in part on the differential ability of some corals to acclimatize to warmer temperatures. David Obura discusses connectivity and recovery of coral communities. Favorable recruitment conditions: These include good water quality, open hard substrate for settlement, presence of coralline algae (provide settlement substrate and chemical cues to facilitate coral settlement), and healthy herbivore populations. Larval supply: Regardless of how good recruitment conditions are (e.g., availability of substrate, presences of important herbivores), reefs require a robust supply of larvae from source reefs to recover following a disturbance event. Connectivity: Reefs with high mortality after bleaching depend on connectivity to other sources of live corals for re-seeding. For example, it is possible for reefs receiving great numbers of larvae from other source reefs to recover in a relatively short time span (~10 years), provided that recruitment conditions are favorable. Grazing: If important herbivores are missing, overgrowth by algae can slow reef recovery by taking up space that would otherwise be available to coral recruits. Natural selection: The recovery of coral reefs may be facilitated by settlement of larvae from nearby, more heat-resistant corals that survived the temperature-driven bleaching event. Over time, this could lead to heat-tolerant species increasing their distribution range into habitats previously dominated by other species.